Every Saturday, I host a feature called Kid Konnection -- a regular weekend feature about anything related to children's books. This week I'm going to share with you a picture book that celebrates kids' favorite part of winter -- snow! Summary: Snowflakes falling! What a treat! Friends gather outside to celebrate the first snowfall of the season with snowball fights, sledding, building igloos, drinking hot chocolate, and making the most of a windy, wintry day. With rhyming text and cheerful illustrations, this is a charming celebration of the winter season. -- Albert Whitman & Co. I'm certainly not looking forward to the first snow of the year, but FIRST SNOW by Nancy Viau and illustrated by Talitha Shipman is cute enough that maybe, just maybe, I'll crack a smile when I see those white flakes falling! 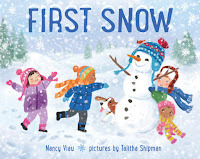 FIRST SNOW is an adorable picture book about two kids (and their friends) and their excitement for the first snow. The text in the book is short and sweet.. and perfect for toddlers; and the rhyming cadence of the words makes it fun to read aloud. I think this book captures the essence of children's joy surrounding snow absolutely perfectly. In addition to the little story, the illustrations are precious. I love the bright colors set against the white snowy background, and the kids (and dog) in the story are too cute. Even the endpaper is fun with its collection of colorful winter hats and mittens. FIRST SNOW is a beautiful and fun book that kids will love. Highly recommended! That looks like a fun, sweet book but I'm with you on the snow.